Do you experience separation anxiety when the love of your life travels away from you overnight? Are you in a long-distance romance and longing to feel together as one? If you are seeking the comfort of someone you love to be right there with you as you sleep Pillow Talk will help you connect with your otherwise inaccessible darling sweetheart sugarplum! With Pillow Talk your distant love’s heartbeat and sense of glowing warmth is as close as your pillow. Whether you’re in down the road, in different cities or in opposing countries, you can always feel a sense of togetherness and your love is just a heartbeat away and as close as your pillow. Each person has a ring sensor they wear to bed at night, and a flat fabric panel which slots inside their pillowcase. The ring wirelessly communicates with the other person’s pillow; when one person goes to bed their lover’s pillow begins to glow softly to indicate their presence. 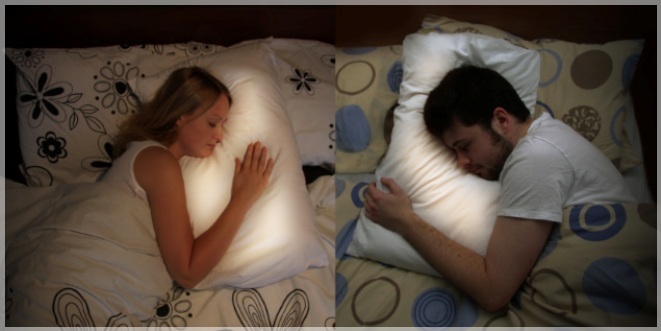 Placing your head on the pillow allows you to hear the real-time heartbeat of your loved one. The result is an intimate interaction between two lovers, regardless of the distance between them. The couple each put on their ring which in turn monitors the heartbeat, and as heads hit the pillow it creates a comforting (or perhaps possibly to some… and eerie) glow. Unfortunately, Pillow Talk is not yet available, pending further development, and now has funding to create manufacture the prototype, and the company is welcoming further funding assistance. Pillow Talk is a creation by Joanna Montgomery, a 23-year who has attended Dundee University, finishing with a First Class BSC in Digital Interaction Design. Her company is Little Riot, and is in the UK. Romantic to some, ridiculous to others… but endearing. Anything that helps the ones you love feel close seems to be a good thing, especially when couples often make sacrifices for work-related trips and military leaves. It may also be nice for when your sweetie may have a hospital stay. Once it is available, it is sure to be romantic gift for many! Previous Where To Draw The Line Next December Solstice – Merry Winter!